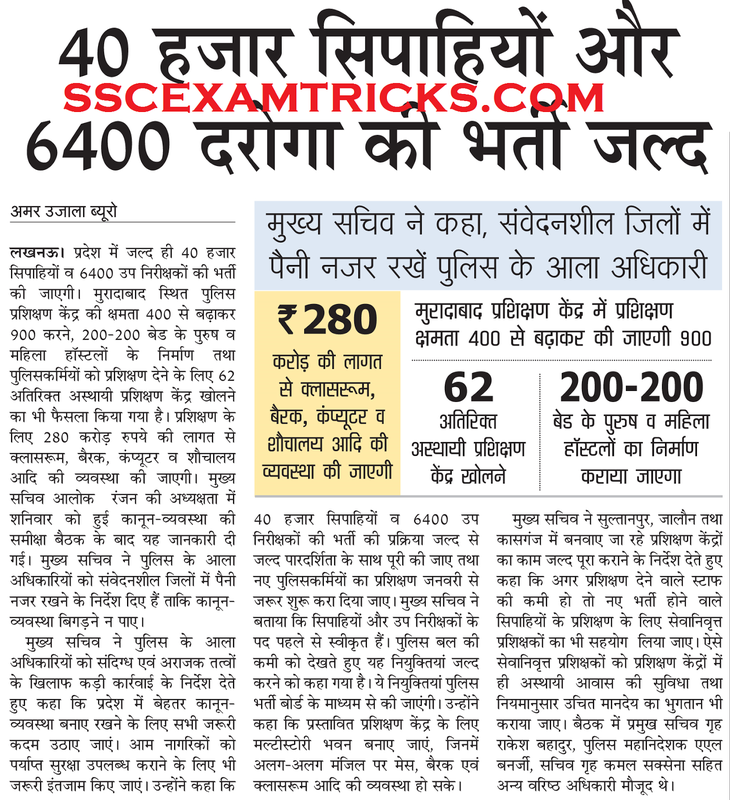 Uttar Pradesh Police Department had announced for recruitment of 46400 posts of Police Constable Posts though ONLINE Application process which is needed to be applied online which can be applied dates (will be updated very soon). Interested candidates who had passed 10th/Matric/10+2/ or other equivalent certificate with minimum 50 % Marks can be applied for the posts of Constable & candidates who had completed graduation Degree with minimum 50% marks from recognized university can be applied for the posts of Sub-Inspector (SI) in UP Police Department. The age limit for the post of constable is 18-22 years and for the posts of Sub-Inspectors (SI) is 18-23 years. The relaxation in the age of the reserved category candidates will be as per government rules of UP state. For SI - Degree with minimum 50% from recognized university. · Candidates are required to have a valid / active e-mail id for themselves. The ID should be kept active for at least a year. Under no circumstance the candidates should furnish an e-mail id which doesn’t pertain to him / her. · Admission to the written examination will be purely on provisional basis, relying upon declaration and fulfilling of eligibility criteria. · Printout of the application should be kept with the candidate for their reference and not to be sent to the organizers. · Multiple applications will be rejected. · The candidates called for the written exam / personal interview will have to appear at the respective venues at their own cost. Organization will not provide TA / HA under any circumstances. · Candidates willing to work anywhere in India should only apply. · No request for change of test center / date / session for examination shall be entertained. · Candidates are required to apply only through online mode. Any other form of application is not permissible. · Canvassing in any form will subject to disqualification. · At the time of personal interview candidates have to produce original certificates as well as attested copies of their certificates in support of their eligibility, failing which their candidature will be rejected. · Candidates are advised to register well before the end date of online application to avoid the last minute rush when there is a possibility of disconnection / inability / failure to log on the Organizations website on account of heavy load on internet. · Candidates called for the personal interview will be required to produce all original documents relating to age and educational qualification. Before applying, applicants are advised to read the eligibility criteria and ensure that they fulfill the stipulated eligibility criteria. · Go to the ‘careers‟ page of the official website. · Click on the ‘Download the advertisement‟ and carefully read the detailed Advertisement. · Click on the ‘Apply Online’ link to register. · Click on the ‘Apply ONLINE’ Link which appears on the screen. · This will open the first page of the new Application. · Fill the basic details such as Name, Mobile No, Email Id, Gender, Date of Birth and Qualification as required in the form. · Check them carefully before pressing the „submit‟ link because you will not be permitted to change these basic details in the application later. d) ‘Registration Completed‟ mail / SMS will be sent to your registered email id and mobile number with the Application Number. This Application Number & Password will allow you to Login further to complete your registration / print registration slip either now or before the Last Date of Submission of Application. · On the screen shown, press the “Login” button. · You will be shown a link which will ask you to Login again. · Proceed with Login procedure by using the Application ID and Password, which will open the second page of the Application Form. · Fill up all the required information on the screens (which are in fact the subsequent tabs of the on-line form) with personal identification details, etc. · Candidates should take utmost care and furnish the correct details while filling in the on-line application. g) Please confirm all the details entered by you before clicking the “SUBMIT” Button or else go back to edit the details. ONCE THE DETAILS ARE SUBMITTED HERE, NO CHANGES WILL BE ALLOWED AT SUBSEQUENT STAGES. · Photograph must be a recent passport size colour picture. · Make sure that the picture is in colour, taken against a light-colored, preferably white back ground, and has no harsh shadows. · If you wear glasses make sure that there are no reflections and your eyes can be clearly seen. Also, ensure that both ears are visible in the picture. Caps, hats and dark glasses are not acceptable. · Religious headwear is allowed but it must not cover your face.